The Democratic anger over the clear victory for all Trump endorsed candidates in last night’s special elections has led to some spectacular outbursts already, but none more so than the (we assume) soon to be deleted tweet by progressive Democratic voice Miss Alyssa Milano who was very clear as to what she thought of anyone not voting for the Democrats in any upcoming election. And thus, anybody that votes Green Party is Russian meddling, just as, according to 90% of US mainstream media, anybody who votes for Donald Trump is Russian meddling. Related coverage: <a href="https://thegoldwater.com/news/33373-Midterms-2018-Dems-Furious-As-Green-Party-Splits-Ohio-12-Votes-Video">Midterms 2018- Dems furious as Green Party splits Ohio 12 votes</a>. Anger over an unexpected loss is understandable, but claiming that anyone who doesn’t vote the way you would like it is Russian meddling becomes, well, childish to say the least. 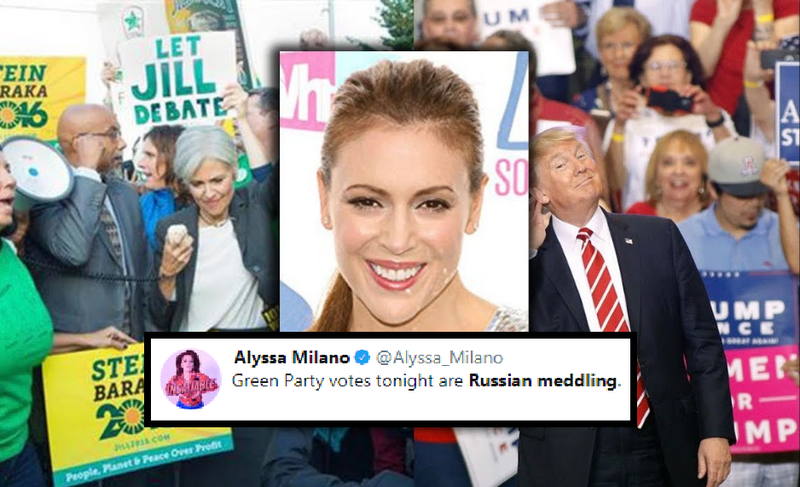 Miss Milano’s stance follows a well thought-out plan by the MSM to call anything that works against the Democratic party a figment of Russia. A few weeks ago, as the #WalkAway movement got too big to ignore (the movement created by a gay hairdresser, a US citizen, to walk away from the Democratic party), CNN stated that the #WalkAway hashtag, which was presented as a grassroots effort by former Democrats who are critical of the party's alleged intimidation, confrontation and lack of civility and want people to walk away from the party, was simply steered by Russian hackers. Ever since then, multiple US citizens have gone online to pledge their support for the #Walkawy cause and explained that they decided to join this movement as per their own decision. Wow! What a hypocritical retard! Green Party was started by the politically correct leftist ideological morons. Their "progressive" thinking is always ripe with group rights and class social reform. Milano now becomes another one who needs a window where her belly button is, what with her head so far up her a$$. Muh Russians Muh Russians!!!!! where was the outrage during Barrys election? Oh that's right its only the Russians when conservatives win elections. What I see are butthurt dems that cannot vote pure socialism and instead vote for some Greeny, bc they only accept warm and fuzzy feels from selling out our futures.